Wow, just wow. 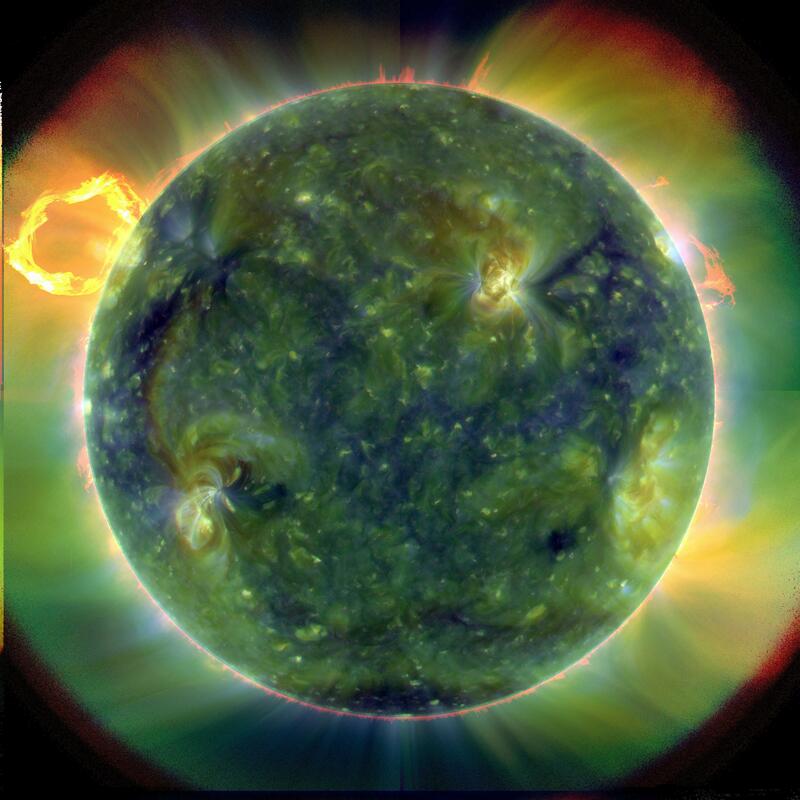 This is the Sun as seen by the recently launched Solar Dynamics Observatory (SDO). It’s actually a combined image, showing several different wavelengths at once (blues and greens represent hotter regions than reds). The SDO is the most advanced solar spacecraft ever launched, and it shows in the level of detail visible in this picture. Just look at all that material streaming out into space; ‘space weather’ like that can seriously disrupt satellites. 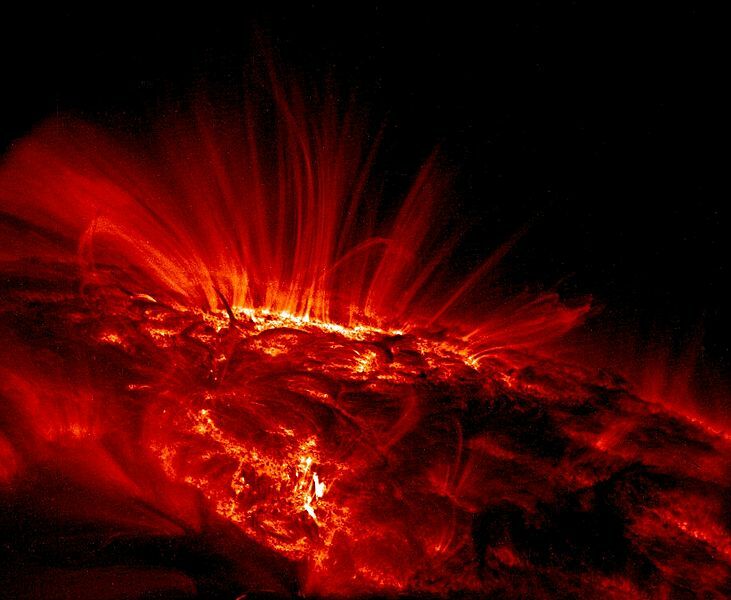 Understanding what’s going on inside the Sun, and therefore predicting the most violent solar events, is one of the main aims of the SDO mission. I love the sense of scale you get when the movie zooms out to show the whole disc. Oh, one final thing, even the SDO’s launch produced great pictures when it destroyed a sundog. It was clearly a good omen for the mission! Have you ever considered why the Moon and the Sun appear to be about the same size in the sky? I think it’s one of those things you just accept and never get round to examining how remarkably lucky that is, and what it would mean for eclipses if it wasn’t the case. It turns out that the Sun is around 400 times bigger than the Moon but also just happens to be around 400 times further away from the Earth – it is this coincidence which causes the two objects to seem to have similar disk sizes. This means that during an eclipse the Moon is able to completely obscure the Sun, giving us a spectacular show in the process. As far as we know there’s no physical reason for the Sun/Moon size coincidence. In fact, since the Moon is actually moving away from us by several centimetres per year, in several million years our eclipses will be a lot more boring! Equally the dinosaurs (if any of them wanted to look) would have seen a Moon which appeared larger than the Sun. Basically we’re just lucky to be around at the optimum photograph time. Interestingly, the reason we know the Moon is moving away is because of the Apollo missions which are being talked about so much at the moment because of the 40th anniversary of the lunar landings. One of the things the astronauts left behind them were reflector arrays (the one left by Apollo 11 is pictured to the right). Optical telescopes have been sending pulses of laser light at these arrays ever since – timing how long it takes the light to return gives the distance to the Moon at that moment. The initially narrow laser beam is several kilometres wide by the time it reaches its destination but, given that the Moon is over 3000 kilometres in diameter, hitting the correct area is a challenging task! Well I think that’s all I’ve got to say about eclipses, but don’t worry as there’s lots more to come from everyone else! Tune in tomorrow when Stuart’s back again to talk about what an eclipse would look like from the Moon’s perspective. Eclipse Week Post 1: Just what is an Eclipse? Harbingers of death and destruction? A neat way to test how gravity works? A good opportunity to wear silly glasses and crowd around strange looking devices? Yes eclipses are all of these things and more… apart from the harbinger of death thing I just stuck that in there to scare you. This week India will be treated to a spectacle which will see people flocking from around the world to witness. Taregna a small town in the Indian state of Bihar will be the epicenter for this event seeing the Sun completely covered by the moon. In honor of this event we here at weareallinthegutter have decided to have an eclipse week celebrating all astronomical based shadows. To start with I want to talk about what eclipses are, how they occur and how we predict when the next one will be. At this point I feel like I have to make a confession: to a professional astronomer there is nothing more terrifying than being asked a question about what actually goes on in the sky. Ask most of us to point a constellation or why planets move the way they do and you will get an answer which will be right eventually, but to get there you will experience a lot of hand waving and muddled sentences. It turns out when you study objects many many times larger than our galaxy which contains all the stuff you normally see in the sky it’s not really that useful to know in depth details of the motion of our little rock and its closest buddies. With that disclaimer out of the way lets get in to the heart of the matter: an eclipse is the mother of all shadows. When the sun and the moon happen to be located in the same place in the sky the light from the sun is blocked ether in part (a partial eclipse) or fully (a total eclipse) by the moon. To get an eclipse we need to have an alignment of the sun and moon and so their paths have to cross in the sky. The path of the sun across the sky is called the ecliptic: a line which passes through all the signs of the zodiac (and in no way determines how lucky you will be in love or business thank you very much!). So why don’t we get an eclipse every month? Every time there is a new moon the Sun and Moon are very close to each other, so why is it that the vast majority of new Moons dont have an accompanying eclipse? Well it turns out that the moon does not travel along the ecliptic like the Sun does but rather a line which is slightly inclined to the ecliptic by about 5 degrees or so. If they lay along the same line then eclipses would be much more regular but as it stands we get at max about 2 a year. This small inclination means that the Moon is normally a little way above or bellow the Sun. The only time we get an eclipse then is when a new moon happens to occur at the point where the path of the Sun and the Moon also cross. Following me cause I am not sure if I am at this point. Ok so now things get complicated as the orientation of the tilt in the moons orbit also changes over time. The Sun’s gravity pulls on the moon a little bit in its orbit and the orbit changing its orientation. Its sort of like what a penny does at the end of a good spin. As it slows down it does that little funny dance where the way the face of the penny is pointing moves around. The technical word it precession but that’s not too important, what is important is that it changes the two points at which the moon’s path crosses the ecliptic and so affects when we can have an eclipse. The third and final effect is that the moon’s orbit is not completely circular but rather elliptical which means that at some points in its orbit the moon is further from the earth than at others and so will appear smaller in the sky. Obviously this has an affect on the type of eclipse we could see. If the moon is just about the right distance from us it fully covers the sun giving a total eclipse but if it is that little further away from us then it leaves a small ring of light around the outside of the Sun which we call an annular eclipse. Simple right? Only the point on its orbit when the moon is the furthest from us also changes with time which we also have to factor into our model. Given the fact that there are three cycles involved which after different periods of time which eventually repeat, it is interesting to ask if the pattern of eclipses also repeats. Well we have three cycles to consider: the times between new Moons which is roughly every 29.53 days, the time between the moon passing the same point on the ecliptic which happens every 27.21 days and finally the time between the the moon being at the same distance from the earth must be the same which happens every 27.55 days. To get an identical eclipse we have to have a length of time in which a whole number of each of these periods will fit. It turns out that happens only after 18.031 years which is known as a Saros cycle. This basically means that 18.031 years after this weeks eclipse another eclipse will happen which looks pretty much identical in the sky. The only difference will be that it will be visible from a different part of the Earth. In fact it has been estimated that it takes 370 years for an eclipse to occur at the same place on Earth. As you can imagine this makes the event in Taregna all the more special for its residents as it is truly a once in many lifetimes event which they are witnessing. I for one wish I was there to see it. Phew ok I think I got through most of that. If any of it is still unclear (which I am sure it is) the best procedure to find out more is to find your local amateur astronomy society, find out which pub they frequent, go there on a Friday night buy a round and casually bring up the topic of eclipses. In no time at all beer glasses, salt shakers and beer mats will be transformed in to a mini solar system to help you visualise what is going on. By the end of the night you will ether be an expert on eclipses or be so drunk that you don’t really care any more so its win win really. Join us tomorrow when Emma will be talking more about why eclipses look the way they do and why Earth is lucky to have total eclipses at all. How the Sun got its groove back. Having just had a “heat wave” here in Scotland we were all reminded that a giant ball of hot gas does indeed grace the sky on a regular basis however two consecutive sunny days in Edinburgh was not the only recent interesting event involving the sun. The Sun, like a middle aged man undergoing a midlife crisis, has donned its leopard print attire once again and after a long absence it has a sunspot again. A close up of a sunspot taken with NASAS TRACE spacecraft. One of the curious aspects of the sun is that it undergoes roughly an 11 year cycle in which the number of sunspots rises and falls. This period is very regular and has been active ever since sunspots have been recorded. Recently we have been in a quite phase of the cycle which was supposed to end late 2007 early 2008 but apart from one small sunspot December last year the sun has remained largely quiet. Its not the first time this has happened as well, records show that around the 1650’s there was a similar (and indeed longer) drought which corresponded to the coldest period of a time know as the “little ice age”. Now before we all get in to a panic and decide on the ridiculous plan of sending some astronauts to bomb the sun back in to activity (they will only go mad and kill each other anyway) I should tell you the good news. A new robust set of sunspots seems to have appears on the sun in the last few days which can be seen in the movie above. Phew, it will be a little longer before we can be sure that a new cycle has stared in earnest but its a good sign. So why was there such a prolonged period of quiet. Well as I said we dont understand the sun fully because we cant “see” inside it, well that might have been what Terry Pratchet likes to call “a lie to children” (not that I think you are children… unless you are I suppose in which case good for you 🙂 ). Light is scattered too much by the sun to be of any use but sound waves are free to pass through the sun easily. We see these waves at the surface of the sun as moments of the material there which we can use to infer whats happening deeper in the sun. In what is perhaps the coolest sounding name for a field of Scientists, asteroseismologists study these vibrations on the surface of the sun like regular seismologists study the vibration of the surface of the Earth to figure out what is going on in our own planets core. A group of these scientists at a conference in Colorado recently announced that they had observed and tracked jet streams about 7000km bellow the surface of the sun. These streams appear to form once every 11 years at the suns poles and migrate to the equator, it also appears that when they reach a latitude of 22 degrees they trigger the next cycle of sunspots. The most recent of these jet streams has been moving slower than the pervious, sluggishly working its way down and has only just recently arrived at the magic latitude. This could be an explanation of why we are just seeing sunspots appear now but there is still a lot to learn, how do the jet streams induce sunspots, why was this last one sluggish, how are the jet streams created themselves and perhaps more importantly who came up with the plot to Sunshine and did they know anything about physics, the answers to all of these (apart from the last one ) will have to remain a mystery just now but watch this space for breaking updates as science continues its slow but inevitable march. This will be very brief as (a) I’m not a solar astronomer so (b) I don’t really know very much about this spacecraft, but as one of the longest running space missions I think we should mark its passing. The Ulysses satellite was launched on 6th October 1990 and has been observing the solar environment at all latitudes ever since – a remarkable 18 years, 9 months (and this is without any servicing or repair visits, unlike the equally long-lasting Hubble Space Telescope). Today at around 2100 GMT the final command – to turn off its transmitter – will be sent and the mission will be officially over. Ulysses was the first solar satellite to have a polar orbit (i.e. unlike the Earth, which stays in the region of the Sun’s equator, it passed over its poles), meaning that it could map previously unexplored regions of the heliosphere. There’s a good movie of its orbit here. In total it orbited the Sun three times, meaning it managed a total of six polar passes. The mission has already lasted four times as long as originally predicted but the weakening power supply, combining with diminishing scientific returns means that sadly its time is now up.